The University of Cebu continues to strengthen its linkages worldwide with the launching of the University of Cebu-Maritime Education and Training Center (UC-METC) Philippine – Nigerian Friendship Project. 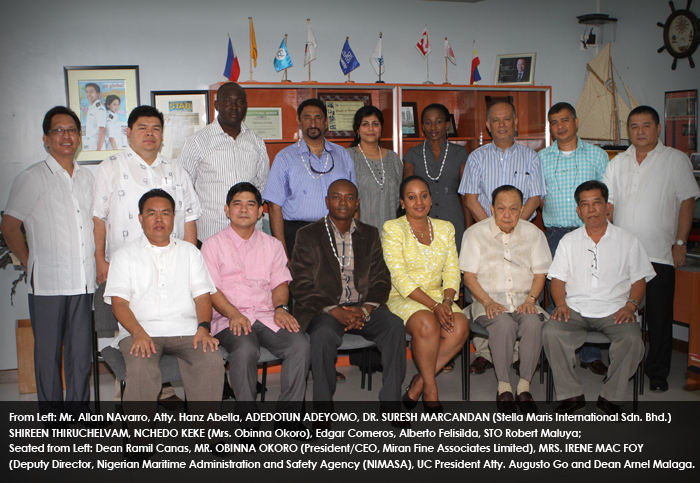 The project brings Nigerian scholars to UC-METC campus located at Mambaling, Cebu City to study Nautical, Marine Engineering and Naval Architecture. The Nigerian Government pre-qualified the students and shouldered the scholars’ tuition, uniform, board and lodging, laptops and other education expenses. This project will augment educational tourism as more Nigerian students choose to study in Cebu City. UC-METC was chosen over maritime schools in London and India, which is a big boost to the Philippines’ image in maritime education. The Nigerian Government sees the project as a form of social engineering, to help its Nigerian nationals to be educated particularly in the maritime field. The project is seen to produce nautical and marine engineers and naval architecture graduates to help rebuild Nigeria’s shipping industry. Aside from bringing in students from overseas, UC also provides scholarships for Filipino students. UC is the only school in the Philippines with numerous foreign scholarships and more than 2,000 Filipino scholars availing. Foreign scholarships available for Filipinos include the Norwegian Ship Owners Association (NSA) scholarship project, the Marlowe Study Now Pay Later Plan, Brize, IMEC, Blue Eastern and MIC.